One recurring problem for online students can be lack of certainty about course layout and basic navigation within a given class, which can result in student frustration (see Brickman 361; Hewett, Writing 38; Peterson 367). 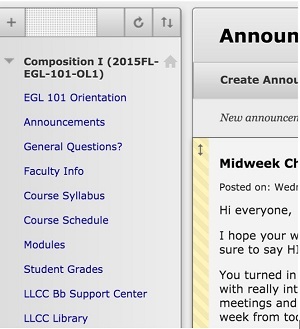 When taking a new online course, students enter the class and have to figure out where to go and what to click. Unlike a f2f class, where students likely have years of experience and are familiar with what to do and where to go when they enter the classroom, online students aren’t guaranteed to know this. My orientation for my online course is comprised of a general written explanation of what is included within this unit and the three distinct videos with separate transcriptions. 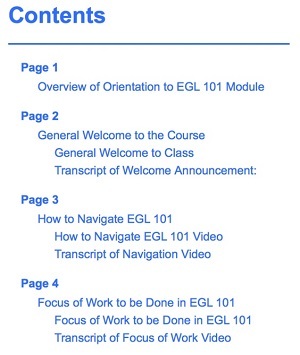 (All three transcripts are collected together within a single text, located within the EGL 101 Orientation area of the course.) While the orientation module resides within the LMS, I have recreated the unit through WordPress, which can be seen here: https://onlineorientation.wordpress.com/ (see tabs at the top of the page to find videos and transcripts).